The Crime Writer’s Association (CWA) 2014 Dagger in the Library Award gives the chance for us, the readers, to nominate our favourite British crime fiction authors for the prestigious award. 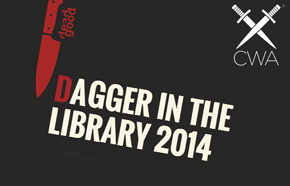 Sponsored by Dead Good Books, the Dagger in the Library is given in honour of the author’s entire collection of work to date rather than one specific book. Previous winners include Belinda Bauer, Steve Mosby and Stuart MacBride. Nominations close on 1st September 2014, so make sure you hop on over to http://www.deadgoodbooks.co.uk/index.php/dagger/ and nominate up to three of your favourites. What’s more, you’ll be automatically entered into a draw and in with a chance of winning £200 worth of crime books!